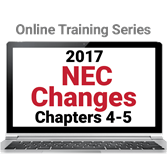 Cover some of the most important changes in the 2017 edition of the NEC® with online training focused on Chapter 4 and Chapter 5. Continue your training on significant updates in the 2017 edition of the National Electrical Code® with NFPA 70® Changes to the NEC 2017 Edition- Chapters 4-5. Interactive online training from the Code source helps you improve your ability to locate, interpret, and apply the latest requirements concerning Equipment for General Use and Special Occupancies. You can't afford to overlook major revisions to some of the most frequently accessed sections of the NEC. Learn from your desk, without travel costs or losing time on the job. First, you'll get an inside look at what's new in Chapter 4 -- including Code changes that impact your work involving cables, switches, receptacles, switchboards, low-voltage lighting, appliances and more – in two online modules covering Article 424 through Article 480 in depth. Then, three more online modules address changes in Chapter 5 that affect how you meet Code when designing and installing electrical systems for Hazardous (Classified) locations, Class I, II, and II Locations, mobile homes, temporary installations, and other Special Occupancies. Go online now and take the latest modules in this dynamic series! Complete this five-hour course series and qualify for 0.5 CEUs. Upon successful completion of all five modules, participants will be prompted to download the CEU certificate directly from the course site. NEC Toolkit Bundle - Exclusive from NFPA!